As 2014 draws to a close, the holidays provide the opportunity to look back on the year and thank you for your continued interest in our work. Rebecca Bertram summarizes the discussions and changes for the Energiewende in 2014. 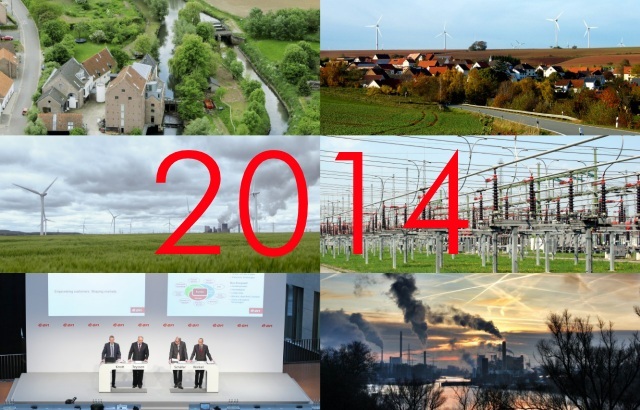 2014 has marked important achievements for the Energiewende, which also faced new challenges this year. It has been a turbulent year for the Energiewende. From challenges, such as the retail power price discussions and Germany’s coal conundrum, to the recent reforms of Germany’s Renewable Energy Sources Act (EEG), the Energiewende currently finds itself in a phase of further optimization. And more needs to be done to achieve greater energy efficiency. Calls for a smarter electricity infrastructure, the need for more flexible and clean backup power, and the transformation of the German energy transition into a European one will drive the discussions in 2015. But 2014 has also marked some important Energiewende achievements. Electricity prices for industry continued to fall and saw their lowest level in 2014, and with 28 percent renewable energies in the power sector, Germany’s grid is now more stable than ever. Other important technological breakthroughs were also achieved: the small Bavarian town of Wildpoldsried became an important testing ground for smart grid technologies, and the world’s longest superconductor was put into operation in the West German town of Essen, to name a few. This year we also began focusing more on what other countries are doing to push their energy transitions at home. For example, we looked at Italy’s success story, coal wars in Poland, and asked how realistic an energy transition is in Russia. We compared the municipalization efforts in Boulder and Hamburg, we asked how the BRICS countries view the Energiewende, and what France could learn from Germany and the UK. We look forward to staying engaged with you with more exciting energy transition stories to come in 2015. Rebecca Bertram works as a freelancer and consultant on energy and climate issues in Honduras. She used to work for the Heinrich Böll Foundation both as the Director for the Energy and Environment program in the Washington D.C. office and as the Senior Policy Advisor for European Energy Policy at the Foundation's Headquarters in Berlin. Before that, she worked on international energy issues both for the German Ministry of Environment and the German Foreign Ministry. She holds a Master's degree in International Affairs and Economics from the Johns Hopkins University's School of Advanced International Studies (SAIS). Thank You for Leading the World to a Renewable Energy Policy that has Liberty and Justice for All. We Need Sustainable Energy Policies, with all hands on Deck, removing Home Owners and Business Persons from investing and keeping their own profits goes against our daily childhood pledge of, With Liberty and Justice for All. 1. Renewable Portfolio Standards (RPSs) which create de facto caps on the deployment of renewable energies (the Germans do not have any RPSs, their Feed in Tariff has no caps. Vote Solar Initiative is a Sierra Club and Solar Leasing Companies platform to ensure that One Utility will take the place of Another through the continued use of Net Metering. Previous PostAll I want for Christmas is new taxation – and….